the spr watertower challenge is a participation event designed to challenge riders of any ability. whether it is to traverse the course in the fastest time or just record a century, this event is for you. there are two routes to choose from: the imperial century (168kms) and the metric century (103kms). both courses travel around the suburbs of perth to visit a number of watertowers. there is a set course and riders must follow it precisely in order to record an official time. the challenge is open to teams of 3 and the team must stay together for the entire event. teams will be dispatched at intervals to try to minimise the impact that this event will have on the road. It is in your best interest not to work with other teams as this is a timed event. the route is complicated and will not be marked on the day. it is recommended that at least one person has a map ready GPS device to ensure you are heading in the right direction. turn by turn directions will also be available. if you are not a member of cycling australia a day licence ($15) is available to cover your insurance during the event. the price of this will be added to your registration fee. time – 1st team away at 6:00am. intervals between teams will depend on final numbers. cost – cycling australia members – $50, non-members – $65. registration here through the IMG website. if you are a cycling australia member you will need your username and password that you received when you joined. team captains will register the team name and specify a password which they will send to the other team mates. you can then join that particular team. format – teams of three that must stick together for the entire event. 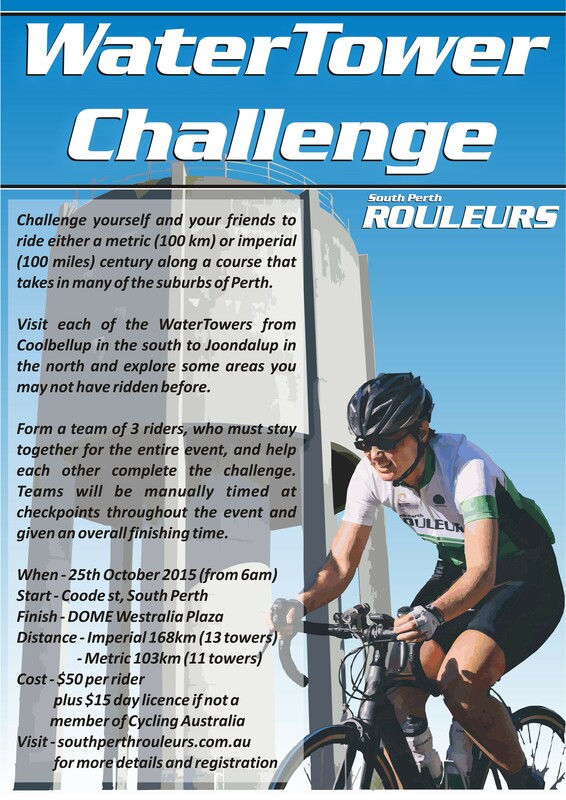 riders must complete a set course that visits a number of water towers across the suburbs of perth. as the course in complicated, it is recommended that at least one rider have a map enabled GPS device which they can download the route to. turn by turn directions will be available to carry with you if needed. a strava club has been setup to allow participants to track the overall times on the day. team members will be provided with numbers that they must display for the duration of the event so that it is easier for them to check in at feed stations. support – there will be 2 feed stations on the course (2 for the imperial and 1 for the metric). at each feed station, each riders will be provided with water, sports drink, and food. coke will also be available at the second feed station. regardless of whether you will be taking any of the food/drink provided, each team must stop and check in to ensure we do not leave any teams out on course. a sag wagon will be available, in case of an accident or mechanical. please ensure that at least one team member carries a mobile phone during the event. a phone number for the sag wagon will be made available on the day. the finish will be at DOME Westralia Plaza and teams must check in so we know who has finished. each rider will be provided with a voucher for a coffee/cold drink. as it will be close to lunch time, feel free to hang around and enjoy a bite to eat while you welcome the other finishing teams. other rules – teams will be started at timed intervals to ensure that the events road presence is kept to a minimum. the course is not closed and will not be marked, but teams must obey west australian road rules at all times. it is the responsibility of each rider to look after their own safety and that of others, and as such, should ride to traffic conditions as necessary. as this is a timed event, it is in your best interest to not join up with other teams although, in the act of obeying traffic signals, it is possible that teams will come together on the road. you do not have to physically stop at any water tower except those with a feed station, but must ensure that you follow the course as it passes them by. the routes pass by a number of shops and public conveniences in case teams are caught short. please study the maps provided before the event so that you have a basic understanding of the route. printed maps – imperial (168km) or metric (103kms) – these maps are made to be printed at A0 size, but you can use them to look at the course, or print to a smaller size. rider instructions will be sent out after registration closes. views of all watertowers and feedzones can be found here. why is it teams of three? – teams of three are part of our safety mechanism for the event. anything can happen to single riders out on course so we ask you to ride with a couple of buddies. events that are this long can often result in someone having a bad day. having two friends along for the ride means that there is always someone to draft behind. once teams reach four riders, they have a tendency to ride two abreast. although this is legal, we aim to minimise our impact on the road and would prefer that teams ride single file. is it a mass start event? – no, each team will get a start time which will be posted a few days before the event (after registration closes). we are expecting that the first team will leave at 6am and the intervals between teams will depend on home many teams are registered. each team will get a quick briefing before setting off on the course. the imperial century teams will leave first. do we have to stop at all the traffic lights? – this is a challenge, not a race and as such the roads are not closed. it is a requirement that you obey all traffic rules and regulations during the event. if you do decide to not obey the road rules, then you actually void your insurance for this event. worst case scenario is that you end up in a traffic accident. can our teams join up with other teams? – we would prefer that this doesn’t happen as each team is timed and the challenge is to see how you and your teammates work together to complete the course. we would also like to minimise that impact that this event has on the general public. what do I get at the feedzone? – at each feedzone, each rider will receive water to refill their bottle, electrolytes and gels/bars/fruit. at the second feedzone, for the imperial challenge, riders will receive the same plus a coke. the feedzones are manned and volunteers will fill your bottles for you. please be nice to them as they are volunteers. do I have to stop at the feedzone? – yes. even if you are not taking on any food or drink, the volunteers need to register your teams time at that stop. this is to show the teams segment times on course as well as ensuring that we have all teams accounted for. is there a sag wagon if I can’t make it around? – we are endeavouring to provide a transport option to pick up you and your bike if you have a mechanical or non-serious accident and cannot continue. however, with the event taking place within the confines of the perth city, most people are probably not that far from home. each rider will be given a card with the relevant numbers to call in the event of a withdrawal or accident. how do I navigate the course? – there are links to the maps above and if you have a garmin device, you can upload the route to follow. if not, then each team will receive a turn-by-turn guide that easily fits in your hand. the course will not be marked. what if our team gets lost? – if you get really lost, call the number provided and we will endeavour to get you back on course. what if one of my teammates has to withdraw? – call the number provided so that we know that they will no longer be on course. if the person does not require assistance, then the remaining two competitors can continue the course as set. what do I do at the end? – once your team has finished, come inside DOME Westralia Plaza to register your finishing time. there each competitor will be given a $10 voucher to be used at DOME Westralia Plaza on that day. please bring extra money if you require more food. after 160kms you probably will. how long do I have to complete the course? – the finishline will remain open till 3pm. that allows about 9 hrs for the slowest team to complete the 168kms at less than 20km/hr. if you think that you will need longer, then we recommend that you join the metric challenge (100kms) and build up to the imperial challenge. if you are not going to make the time cut, please call the number provided so that we can account for all riders.